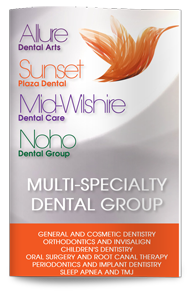 Our Western Dental HMO dental insurance dentist in West Hollywood has a range of dental treatment solutions to meet your unique dental health needs. Our multi-specialty, boutique-style practice has a team of dental professionals that includes general dentists, an orthodontist, a pediatric dentist, an endodontist, a periodontist and cosmetic dentists to help you achieve the smile of your dreams. Healthy teeth have been linked to better overall health. While you may not think about your heart as you are brushing your teeth, research reveals that periodontal disease, which is associated with poor dental hygiene, increases your risk of cardiovascular disease. Keeping your smile healthy is just one way to keep your whole body healthier. We offer educational services that can provide you with the information you need to make good choices about your dental health. Preventative treatments that can help reduce your risk of dental health problems are available. Our Western Dental HMO dental insurance provider in West Hollywood also offers you with treatments and procedures that can restore your smile. Whether you have suffered decay, gum disease, tooth loss or dental trauma, we have treatment solutions that are right for you. Your smile can once again be functional, healthy and beautiful. Your smile should be a source of confidence and positive self-esteem. We can help you recreate a beautiful smile that you can be proud of. From teeth whitening and tooth-colored dental fillings to smile makeovers and full-mouth reconstructions, we will carefully customize a treatment plan just for you. We want every smile you share to be full of confidence and your own one-of-a-kind personality. Are you ready to rediscover a confident, radiant smile? We are ready to help. Contact our dental office today to schedule a consultation with our cosmetic dentist in West Hollywood and get back on the road to good dental health.